Words of mouth, seniority, and sponsorship with allies in the industry all act as important indicators when clients choose partnership. Riding on it experience curve for years in developing gas guns, WE demonstrates once again that it can beat imitators from China. In the other hand, PTS developed by KWA also excels its competitor by winning its sponsor from Magpul. It’s a race on capability, fames, and persistence on quality. Let’s say ‘Hooray!’ to cheer Taiwanese Airsoft gun manufacturers. Finally, the first real wood version of AK will be born in WE AK family in May, as their third model in AK GBBRs, it inherits all the merits from antecedent, AK PMC,【GG242】.Perfect laminate wood finishing in handguard and stock, full metal body and fidelity in dismantling, better regards it as an artisan work than a piece of toy gun. 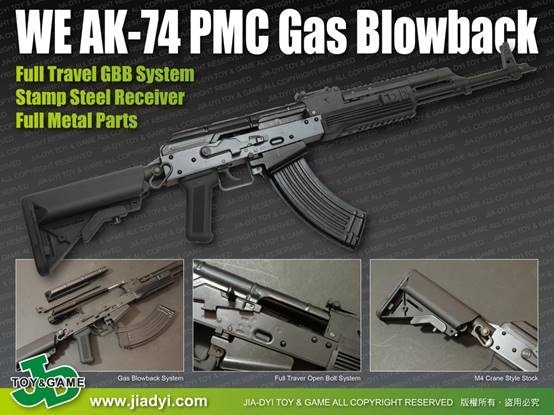 As usual, WE maintains its competitive price to similar GBB models from GHK AK74,【GHK-74】and KWA AK74M,【GG243】,a polymer folding stock/handguard setting. One of the modern AK which has been beloved by PMC. Many improvements had been made to this version by WE factory since its first appearance in late 2011. It is a miracle that Taiwan gas gun manufactures keep leading on the edge of competition with Asian competitors for a long time. There’s not thing but quality speaks for everything! 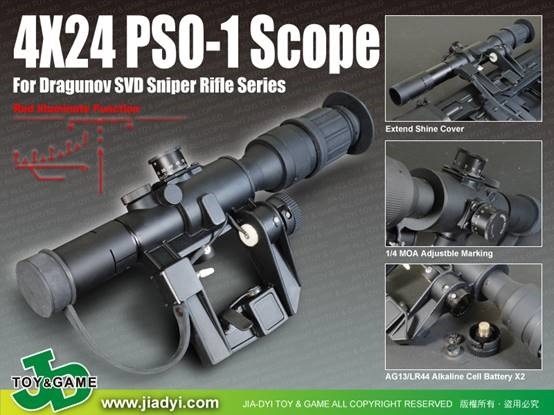 Once had been overwhelmed by AK fans, the PSO-1 type scope replica is restock by AIMTOP now. Stealth black and illuminated by AG13/LR44 cell batteries, it is a must buy for Kalashnikov believers in the circle of Airsoft because of its exotic cool style. Professional Training System (PTS) requires every detail alike in weapons as much as possible with the real fire arms, usually for the drill purpose. 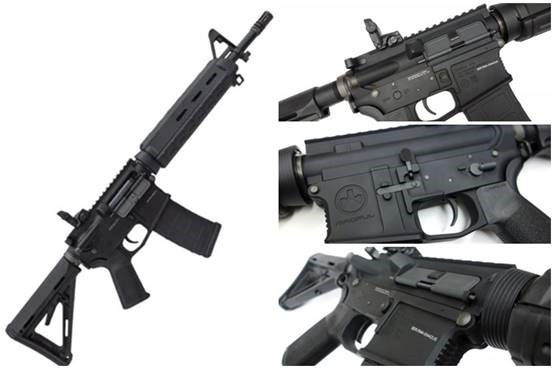 KWA plants the concept into the Electric Recoil Gun (ERG),and developed two version of AEGs licensed by Magpul, standard carbine,【GG520】, and CQB or scout rifle, 【GG521】. Core features include a mechanical / electrical cut-off with the last round fired, functional bolt release, and simulated recoil via the proprietary Kinetic Feedback System. The included ERG PMAG is specifically designed to work with the auto cut-off system. The ERG is also compatible with standard AEG magazines (though the auto cut-off feature will not be active with these). 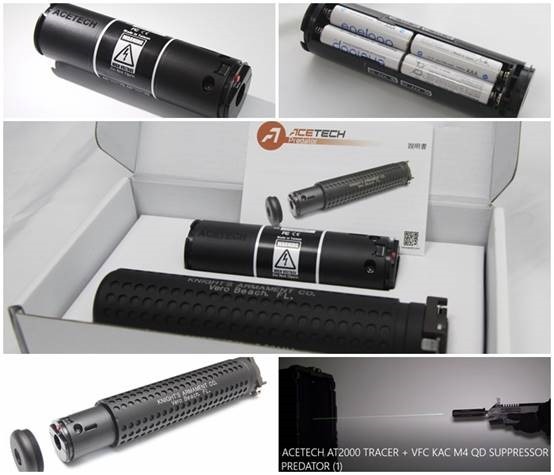 If you want to see flame burst from the muzzle, AceTech ‘s tracer unit, Predator®, is a smart device that make Airsoft hobbyist “get two birds with one stone”- a tracer module, AT2000, along with a suitable carrier, KAC M4 silencer made by VFC. With 32.2mm in diameter and 113mm in length, the AT2000 module,【AT2000】, can be bought individually, easily be accommodated within your spare silencer (with O-ring/tape as spacer). Support to 30rps, it performs well even under DAYLIGHT. The best dealer is a dealer who brings you more than you can expect. We carry all the stuffs mentioned above. Talk to us at sales@jiadyi.com and let us know more about you, see what we can bring you from the rabbit hat.